Preseason camp opens bright and early on Monday morning, and I'm looking forward to it. I mean, there's no better season than football season, right? To tide you over until then, be sure to check out the Donald Thomas feature in Sunday's Register. Here's a sneak peak at the terrific photo taken by Register photographer Peter Hvizdak last week in the Shenkman Center weight room. UConn strength and conditioning coach Jerry Martin gave Thomas a hard time for not leaning on a heavier dumbbell for the photo, but it's still a great shot. Donald is an interesting guy from a great family. Unfortunately, I was unable to secure the one photo I really wanted to use for the story. It seems Donald earned Eagle Scout honors in high school, unofficially making him the largest Boy Scout in history. We couldn't coordinate a photo exchange with Donald's parents in time, but the skills he learned in the scouts still serve him well. You can ready all about that and more Sunday. EDIT: Make that Monday. What are the odds Barry Bonds and Alex Rodriguez hit milestone homers on the same day? Thanks to Barry's steroid-aided 755th, the Donald Thomas story was a (very) late scratch on Saturday night and is not in Sunday's paper. It will run in Monday's editions. There's been plenty of football news in the print edition of the Register this summer. As for the blog, it will be back at full strength starting now, so relax. Have a cream soda. There'll be a whole season to misinterpret my sarcasm and bad jokes and to scratch your head at irrelevant and obscure pop culture references. It all starts Monday. I promise you won't be disappointed. And please, for the love of God, stop emailing me about the lack of entries, people. Cabeesh? Since I have some time to kill, I'll provide a quick summary of my summer (complete with photos). I traveled a bit, mostly to attend more weddings than I can even remember, and utilized my new digital camera. My approach to photography can best be described as unconventional. Rather than take the traditional posed (read: boring) pictures at weddings and such, I go for spontaneous shots. Is someone in mid-yawn or about to sneeze? Then let me get my camera. There's nothing better than sharing photos and watching people react in horror at pictures of them picking their nose. At any rate, my wife would kill me if I used any of those (especially considering most are of her). But here are some others from my summer. 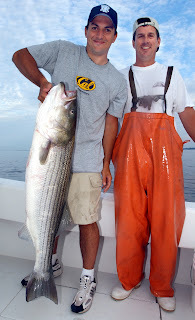 Here's a 50-pound, 40-inch striper I caught about a mile offshore in Westbrook. Snagged it with a live bunker, and nearly broke both arms reeling her in. This thing was the size of a kindergardner. That's captain Keith Salisbury, the best in the biz, standing next to me. OK, I confess. This photo was taken three summers ago. But I loved that fish. He was delicious. Here's a house I'm considering buying from Wayne Huizenga in Ft. Lauderdale. You know, just a little something the wife and I can retire to. I'm only about $17 million away from the $17 million price tag. Here's a shot of my boat. She's a beauty, eh? The big one is kinda nice too. Editor's note: Chip Malafronte does not, has never and will never have enough money to own a boat. Went to a wedding in Dallas and made sure I visited this landmark. It's the old Texas Schoolbook Depository. Lee Harvey Oswald fired the shots that killed John F. Kennedy from the sixth floor of this building, now a museum. The window Oswald fired from is on the far right of the near building, just above the tree line, second floor down from the top. Inside, this place is as fascinating as it is eerie. The area around the window is just as it was in November 1963. Notice the 'x' on the center lane of the highway? That's where the JFK motorcade was when the second bullet struck Kennedy. 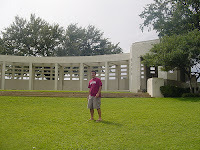 That's me on the grassy knoll. The place needs no explanation. It's where Roger McDowell spit on Cosmo Kramer not long after a crucial Keith Hernandez error cost the Mets a ballgame (ruining the afternoon for Kramer and Newman). Luckily, there were no second spitters on this afternoon. 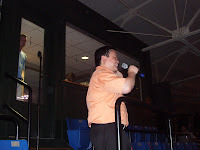 American Idol misfit William Hung sang during a New Haven County Cutters baseball game at Yale Field which I was covering for the Register. He's been taking singing lessons. He's still awful. Nice guy, though. That's all for now. Well, maybe I'll sneak in a few later. See you Monday.